The Alliance of Area Business Publications is an organization of over 70 publications dedicated to delivering customized regional business news to professionals in the United States, Canada, Mexico, Puerto Rico and Australia. 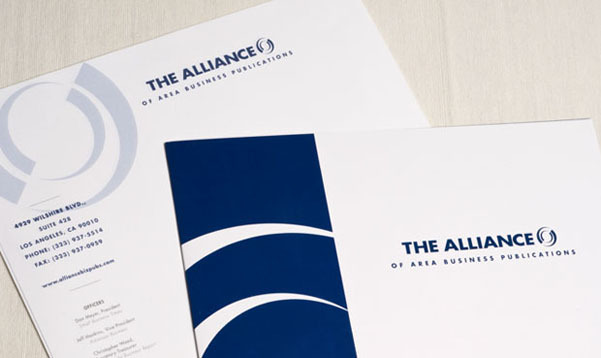 We were approached by The Alliance of Area Business Publications to create a brand identity for this growing alliance of publications. Although The Alliance is a group of publications, we did not want to take the approach of creating a logo that would look like a newspaper mashead. This group needed a stronger and more substantial look which is why we decided on a very bold font and dark color palette. We were then tasked with applying that look to other marketing pieces including presentation kits, direct mail and fully customizable advertising for every geographical market they served.